The author discusses how professionals should go about creating a customized referral marketing strategy. It begins by choosing a focus. Next, it involves the creation and posting of educational content that creates a clear connection between prospects’ challenges and your firm’s expertise. 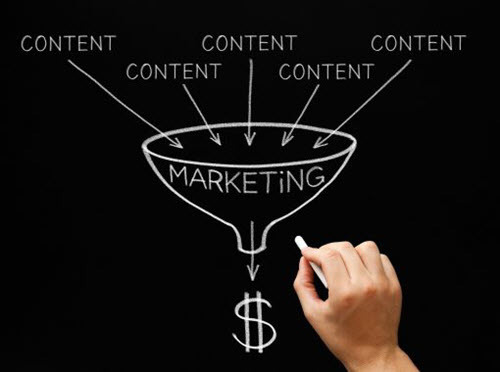 The key is creating the funnel content. The author describes the steps to create such funnel and how that will lead to more successful connections and possibly engagements. Effective referral marketing begins with being able to speak to your audience’s challenges and interests—and you may think you already know what those are. But our studies involving accounting and financial services firms reveals that many firms have blind spots about the concerns of prospects—and, that conducting research about your audience is the best way to fill in these gaps. To get the insights you need, you can either do primary research (interacting directly with prospects), or secondary research (reviewing studies or surveys conducted by third parties). You can also ask your internal teams about the questions and objections they regularly hear from prospects, discover where people in your target market network, and investigate which topics your competitors talk about on their websites. After you have done your research, you can start creating a customized referral marketing strategy. Which of our services delivers the best results? Where does our marketplace research point to the greatest need or promise? Which of our services have the strongest financial profile? Other factors to consider are where your firm excels, and any specialties, differentiators, and positioning that set your firm apart. The “sweet spot” will be those issues that are both important to your audience and that your services address, because that is where your specialized expertise will be most relevant. Next, decide how you want to create and use educational content to create a clear connection between prospects’ challenges and your expertise. Your answer will depend on your resources, and how aggressively you can develop content. Some firms post new blogs several times a month, while others post weekly or even daily. (For best results, we recommend posting at least once a week). However, you should consider other forms of content as well, including tweets or LinkedIn posts. A separate, more substantial type of content includes research studies, books, or guides. Generally, this material goes into more depth, and should be designed to stand the test of time. It is also where you can go into greater detail about your positions and make more definitive statements regarding industry issues. An effective referral marketing strategy will generally use both shorter and longer, more substantial forms of content. 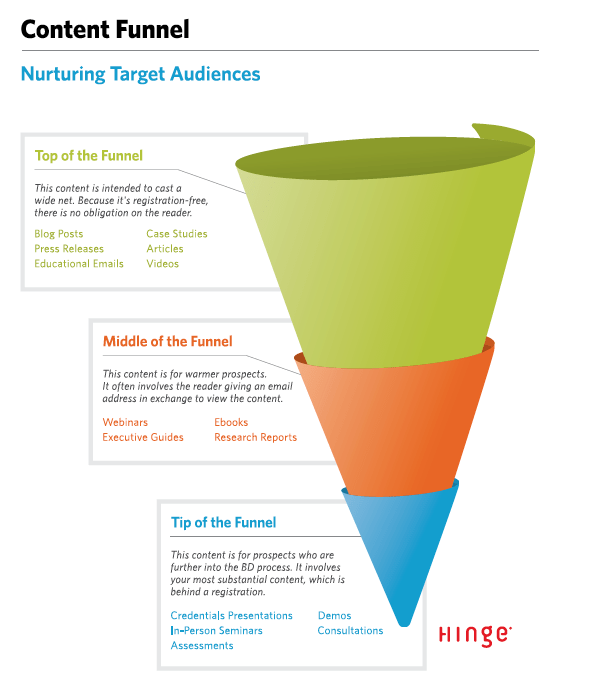 When working together, these two types of content create the content funnel, as shown in Figure 1. It is no accident that this content funnel looks like the tried-and-true sales funnel—in fact, the two can work hand-in-hand. At the top of the content funnel are blog posts that give readers quick industry tips or perspectives, helping them become familiar with your expertise. If they find your content useful, these readers will keep coming back—and hopefully start digging deeper into your site for more substantial content. Because these latter types of content require the reader to share their e-mail address to download, they give you the opportunity to engage even more closely with prospects. But even those who do not move all the way through your funnel to become clients can still make informed referrals to your firm—based only on what they have learned about your expertise. As you decide how to coordinate your referral marketing strategy with these two types of content, there are a few more factors to consider. First, how will you promote your content? Two of the most effective ways are using social media and search engine optimization to help your content show up in your audience’s online searches. Second, who will author your content? Are there individuals within your firm whose reputations may help attract attention to your content? Or are there emerging Visible ExpertsÒ at your firm who could build their reputations by publishing content? If your experts are too busy to write regular content themselves, consider hiring professional ghostwriters to help. Third, think about how your content will fit within your firm’s overall strategy. Content can change how your firm is perceived in the marketplace—so make sure your efforts to create and share it are closely integrated with the rest of your brand strategy. The services you offer, how you talk about your firm and its expertise, and your different types of content should all be consistent. With a well-thought-out approach to content, you are well on your way to generating new referrals and new business. Next comes the challenge of creating the content—and then beginning to reap the benefits.